Enjoy world-class experiences, from spa to golf to hiking, on Silverado’s 1,200-acre of slice of heaven. Expect some of the nation’s best golf. Two PGA courses — limited to members and resort guests — await, promising an exclusive day on the links. Relax, rejuvenate, and recharge at the esteemed Spa at Silverado. Locals look to us for our market-fresh, sustainably-sourced menus — we invite you to, as well. There’s a reason why our tennis program was recently ranked #15 worldwide by Tennis Resorts Online. With 10 Plexipave courts and an expert staff, guests can hit the courts on their own, register for a tournament or camp, or take a daily clinic to improve their serve. Work off all that wining and dining. Our professional trainers are available for coaching, while our instructors offer more than 30 fitness classes weekly, including yoga, waterFIT, and TRX® Suspension Training. After a round of golf or a day of wine-tasting, lounge poolside at our exclusive resort pool. If you reserve a swanky poolside cabana, you’ll enjoy fresh water and fruit all day long. CABANAS: Reserve your Cabana! Open Memorial Day Weekend-October 8. Cabanas are only available for hotel guests and members. All pricing includes bottled water and fresh fruit for (4) people. To reserve a cabana contact silverado.concierge@silveradoresort.com. You can rent a 15-speed mountain bicycle on an hourly or daily basis. 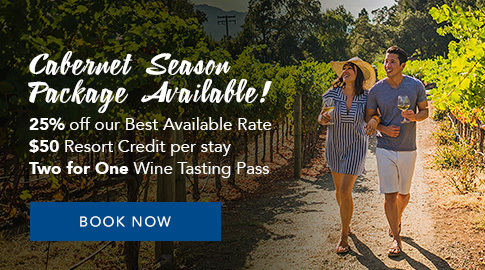 Or you may choose to take advantage of a half- or full-day tour led by Getaway Adventures or Napa Valley Bike Rentals. Tours include picnic lunches and visits to some of Napa’s iconic, beautiful wineries. Bike rentals are seasonal, available May-October, so be sure to check with our Concierge team for details. Touted as one of the best bicycling routes in Napa Valley, the Silverado Trail is found on the east side. It features 26 miles of Class II bike lanes, from Trancas Street in Napa to the junction of Highway 29 in Calistoga. Crossroads provide riders access to the town of Yountville, as well as Rutherford and Oakville communities, and the city of St. Helena. The east side of the valley is rural, with few public facilities. Several wineries in the area welcome riders in need of a rest room, water, or, simply, a break. Get the most out of your stay. Tackle a hiking trail, bike to a nearby winery, or kick back for a relaxing game of bocce. HIKE: Our staff is happy to provide you with a map outlining the jogging trails which are located nearby. In addition, there are fabulous hiking trails at nearby Skyline Park, Moore Creek Park, Bothe State Park, and Alston Park. BOCCE: Play a game of Bocce on one of three courts located at our Spa. BIKE TOURS: Private and corporate group tours are offered by Getaway Adventures and Napa Valley Bike Tours. Tours can be tailored to your group’s specific needs. Memorialize your stay. Our shops offer the latest styles in performance shirts, sweaters, swimwear, hats, and more.